Charles Sturt University (CSU) research is evaluating the use of canola meal, a by-product of oil production, as a supplementary feed ration for beef steers. CSU Bachelor of Animal Science (Honours) student Emma Lynch (pictured) says there is an increasing demand for grass-fed beef that complies with the Pasture Fed Cattle Assurance System (PCAS). The advantage of using canola meal, rather than supplementary feeding with a traditional finishing grain diet, is that producers can still meet the PCAS guidelines. “Pasture growth and quality can be variable throughout the year and supplementary feeding in a grass-fed production system is one way that producers can meet carcase specifications,” Ms Lynch said. “The canola meal we have used is a by-product of oil production and in recent years it’s been a cheaper option than the pellets producers often use to supplementary feed their cattle. The 60-day trial saw 20 steers fed a supplementary ration of canola meal and another 20 steers fed pellets. “The steers were weighed every 14 days to compare growth rates and we also collected samples to study the fatty acids in the blood, in particular Omega-3,” Ms Lynch said. “At the end of the trial the steers were slaughtered and we will be assessing the meat quality along with the fatty acid composition of the carcass. The fatty acid data, in particular the amount of omega-3, will provide valuable information that will link with other projects examining human health attributes of meat. “I hope to be able to give producers more information about the effect of canola meal on live animal performance and carcass quality so they can make better decisions about how to fill the feed gap in their production systems. The research is supported by a Graham Centre Honours Scholarship and supervised by lecturer in farming systems Michael Campbell from CSU’s School of Animal and Veterinary Sciences and NSW Department of Primary Industries (DPI) livestock research officer Dr Edward Clayton. 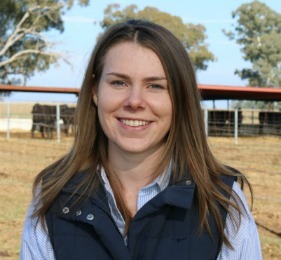 Ms Emma Lynch will present her research at the Graham Centre for Agricultural Innovation’s annual beef forum in Wagga Wagga on Friday 4 August. Source: CSU. The beef forum will run from 9am to 1pm and the cost of $25 includes lunch and morning tea. Register to attend here https://www.trybooking.com/book/event?eid=280147. The Graham Centre is a research alliance between CSU and the NSW Department of Primary Industries. I would be very interested in the outcome of this trial. Unfortunately I wont be able to make it to the beef forum. Will Beef Central be publishing a report on this?